RedImages is a free and open source batch photo or image resizer apps. It lets you resize hundreds of photos or images in a matter of minutes in a quick and easy way. With RedImages , you can shrink or resize PEG, BMP, GIF, PCX, and PNG image files, along with other supported formats, and dramatically reduce internet transfer times, enabling you to quickly and easily prepare your image collections to be published on the web. 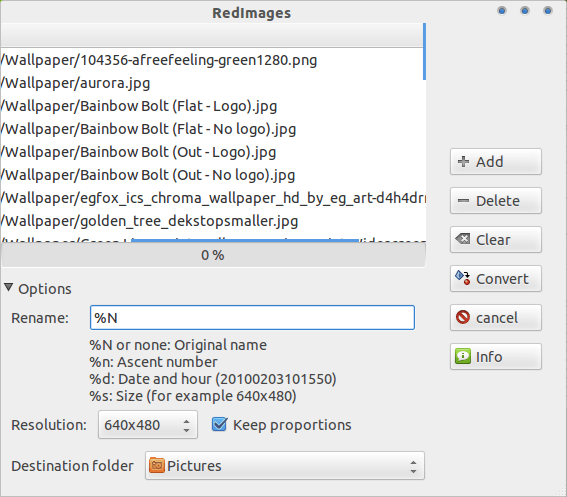 Currently Redimages available in version 1.0.2. Only work on linux paltform, the installer package available in .deb and tar.gz, you can download it via download button below.